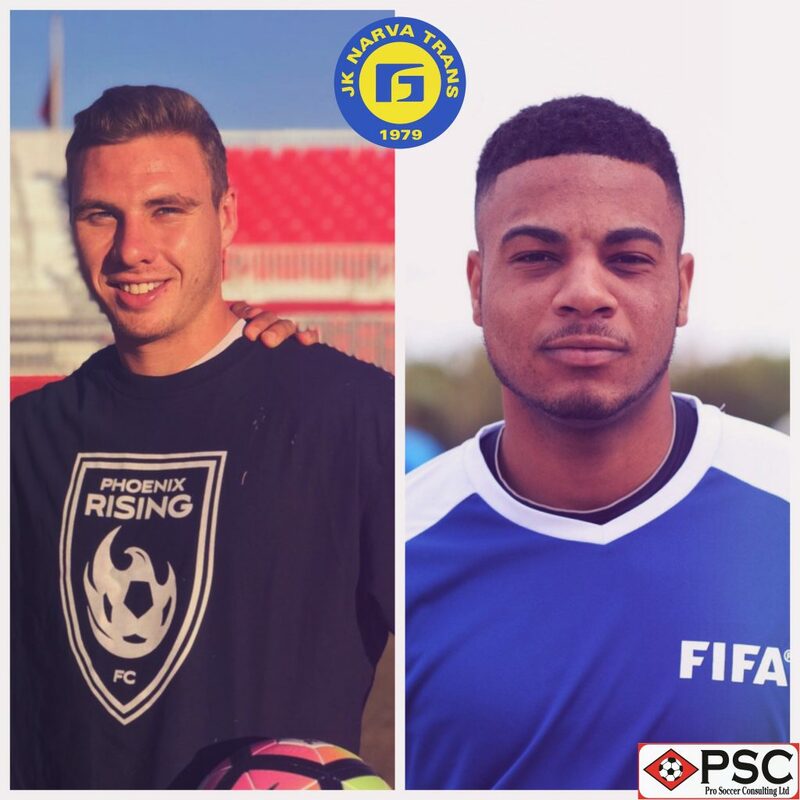 PSC Pro Soccer Combine attendee Dante Leverock and PSC Agency recommendation Matthew Hurlow-Paonessa have earned trials with Estonian top-tier side JK Narva Trans. 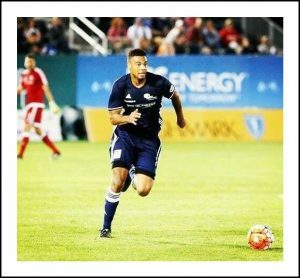 25-year-old Bermuda international, Leverock, impressed a number of professional coaches and scouts during PSC’s Fort Lauderdale combine last month, and PSC’s network of Baltic scouts, including former Narva Trans striker Aleksandrs Čekulajevs, quickly recommended the defender to the club. 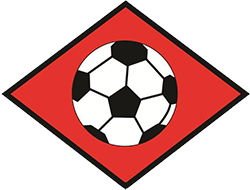 Meanwhile, PSC Director and former Tulsa Roughnecks (USL) Assistant Coach Tom Taylor was alerted to Hurlow-Paonessa’s availability following his release from USL side Phoenix Rising, and notified PSC’s Baltic contacts of the frontman’s ability. Speaking following confirmation of the trials, ex-USL player Leverock expressed his gratitude in being offered a professional opportunity in Europe. “I want to thank PSC for providing me with an opportunity to further my professional career,” said Leverock. “The combine was a great experience and very well organised – I was able to showcase my skills in front of a number of coaches. In Pursuit: Dante Leverock in USL action for Harrisburg City Islanders (now Penn FC). Meanwhile, Hurlow-Paonessa reflected on the challenges he expects to face during the trials, and how those challenges will help maintain his focus. He said: “Being far from home and leaving friends and family can have different effects on players, but for me it’ll help my concentration on the field. “I’m looking forward to showing what American players have to offer in Europe, as well as learning from new experiences along the way. “I can’t wait to start trialling – I’m sure the experience will help me progress, whatever the outcome,” concluded Hurlow-Paonessa. Leverock’s Bermudan roots ignite old memories for PSC’s Managing Director Paul Taylor, who made history when he brought Kyle Lightbourne to Walsall FC in 1992, making the forward one of the first Bermudans to play professional football in Europe. Lightbourne went on to be a great success at the club, and earned a move to former English Premier League side Coventry City for a then-significant fee of £500,000. Indeed, Leverock will be looking to follow in the footsteps of his fellow countryman and make his mark on European soil. And having evaluated Leverock’s on-the-field ability a number of times over the years, PSC Director Tom Taylor revealed that the Narva Trans trial could be a perfect opportunity for the centre-back to reignite his professional career. “Estonia is a great chance for both of the lads [Dante and Matthew] to begin their careers abroad,” said Taylor. “Dante came on our Showcase Tour of Sweden in 2014 and it’s clear he’s progressed since, gaining experience in the USL. 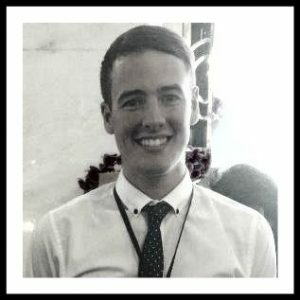 “Over the years the USL has seen significant growth, meaning more high-profile players are being attracted to the league. This makes it considerably harder for up-and-coming American players to show their worth, and this is why opportunities in Europe are invaluable for individuals,” added Taylor. 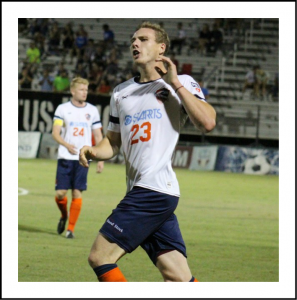 Celebration: Matthew Hurlow-Paonessa in action for PDL side San Diego Zest. And Taylor reflected on how Hurlow-Paonessa’s experience and desire to succeed in Europe could be vital during the trial period. He said: “I know Matthew from being involved in the USL over the years, he also had a successful spell with PDL side San Diego Zest. “With all of his experience, I’m sure Matthew will take positive steps in Estonia. His willingness to play in Europe is also invaluable. “Players don’t get trial offers in Europe very often, and I believe both Matthew and Dante have the experience and mentality to succeed In Estonia,” concluded Taylor. All of the staff here at PSC wish both Dante and Matthew the very best of luck during their trial periods with JK Narva Trans. If you would like to follow in the footsteps of Dante and Matthew, please e-mail info@pscltd.co.uk for more information on PSC’s programmes. PSC will be hosting their two remaining Men’s Pro Soccer Combines in Florida and Texas this January. You can see all of our success stories here.